Margaret Blank: Thoughts from a Textile Artist: How Far Did I Get? Another Wednesday's rolled around. How far did I get with last week's list? and "Xpresspost International" (read: 'speedily by air' -- $70 CAD, insured and tracked -- "guaranteed" delivery in 5-7 business days). Wanting it to get to France by March of this year, did I have much choice?! 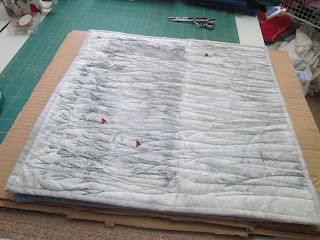 I leave you now to return to my quilting...with a major focus on finishing Section 1 of the Japanese Taupe Quilt intended for my son and his fiancee as a wedding gift. Even with an extra day this month/year, July will be here before I know it! 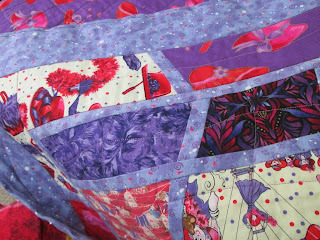 Photo from 2014 -- this is now sandwiched and being quilted! P.S. For those of you who 'follow' this blog on Facebook: I am "off" FB through Lent -- starting today (Ash Wednesday) and not returning till Palm Sunday (March 20). 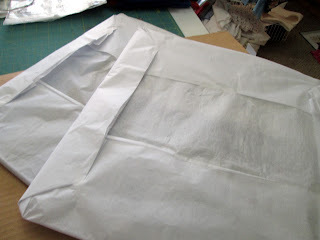 This blog post will continue to link to my personal page, to the 15 x 15 page and to my business page (3 F Creations) on FB, but I will not be stopping by to view comments. If you wish to comment on my posts during the next 40 days or so, please do so here. And thank you for your support! I see you are busy as usual.... congratulations on the European exhibit. I like your sharing of the ship process... I am about to ship to Taiwan. Be well. L's Magic Tiles quilt is lovely. France is a long trip and I wish your quilts a safe journey. 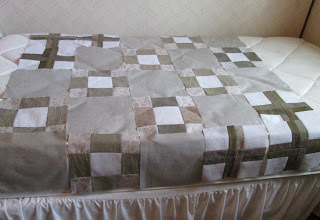 I'm loving the taupe quilt and yes, July will be here before we know it. Congratulations on the Biennale Internationale d’Art Textile 2016 in Beaujolais! Are you able to attend? Thanks for your shipping tips. As well, thank you for linking to TN&TN's WIP Wednesday! Laurel, I'm replying here as I cannot find an e-mail address for you...Alas, no, I won't be going to France! My pieces travel far more than do I! If I spent half the time making things that you do logging about them, I would have a house filled with creativity. You are amazing.